What has the study of urban phenomenons in common with medical examination? Both could be described as studying a ‘body’ and trying to find explanations of it’s ‘functions’ in the wider context of ‘elements’. This is in both areas a rather practical and realists view with a dramatic functionalists angle. The rational definition of the city as a body, as for example discussed HERE, has its fascination and many famous urbanists are or have linked to this visualisation. It does convey a certain familiarity in its illustration. However it is far from an abstraction and thus is not very helpful. It only shifts the problem in question from one complex into the other one. Image taken from Wikipedia / Computed tomography of human brain, from base of the skull to top. Taken with intravenous contrast medium. However, since both fields are struggling with their respective complexity it could be an option to transfer techniques for examination. This is what Martin Krieger proposes in his new book ‘Urban Tomographies‘ published by University of Pennsylvania Press 2011. Krieger proposes to transfer the techniques of exploring phenomenons through a large number of examples as for example used in CT scans, a technique where organs or other ‘elements’ are envisioned through numerous individual slice images. It is used to generate a three-dimensional image of the inside of an object from a large series of two-dimensional X-ray images taken around a single axis of rotation. Basically many small frames are used to piece together the larger whole. This is useful since organs can be visualised and examined without actually having to open. These sort of scans are often used in parts of the human body like the brain where surgery is extremely difficult. Transferring this technique, with all the necessary alterations, to the field of urban analysis is an intriguing proposal. Especially in the context of the current hype of massive data sets and large scale collections, the term tomography seems an appropriate umbrella. It already has its coining which is relatively balanced. However literally translated it would be closer to something like a laydar scan or mesh model used for 3d representation of urban environments such as in the lates OVI Map 3D. In his investigations Krieger focuses on Los angeles and includes photography as his main method or study. Besides this he also integrates sounds and the recording thereof into his investigations. The book begins by introducing tomographic methods and the principles behind them, which are taken from phenomenological philosophy. It draws from the examples of Lee Friedlander and Walker Evans, as well as Denis Diderot, Charles Marville, and Eugène Atget, who documented the many facets of Paris life in three crucial periods. Rather than focus on singular, extraordinary figures and events as do most documentarians, Krieger looks instead at the typical, presenting multiple specific images that call attention to people and activities usually rendered invisible by commonality. He took tens of thousands of photographs of industrial sites, markets, electrical distributing stations, and storefront churches throughout Los Angeles. He also recorded the city’s ambient sounds, from the calls of a tamale vendor to the buzz of a workshop saw. Krieger considers these samples from the urban sensorium in this innovative volume, resulting in a thoughtful illumination of the interplay of people with and within the built environment. 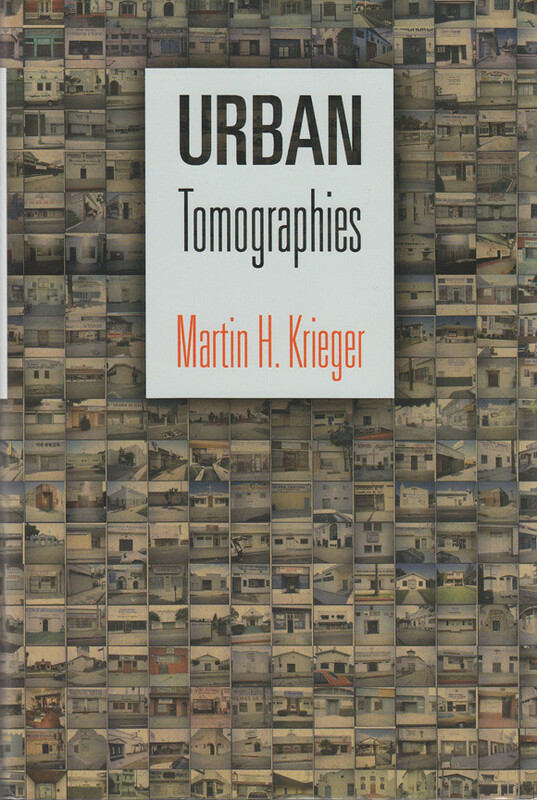 With numerous maps and photographs, as well as Krieger’s unique insights, Urban Tomographies provides an unusually representative and rounded view of the city. Image taken from Urban Tomographies / Book cover. Krieger, M.H., 2011. Urban Tomographies, Philadelphia: University of Pennsylvania Press. Thanks for this, looks awesome. I guess the ultimate reference would be the Bernd + Hilla Becher works. The steal monsters and water tanks are really impressive.